Jen Nadol, author of THIS IS HOW IT ENDS, discusses an ensemble cast and how this book nearly (but not actually) killed her. 3 Jen Nadol, author of THIS IS HOW IT ENDS, discusses an ensemble cast and how this book nearly (but not actually) killed her. What is your favorite thing about THIS IS HOW IT ENDS? The characters. Both the process of writing them and how they turned out. Just like the characters in the novel, I had a close-knit group of male and female friends in high school. The ones in the book aren’t modeled on my friends, but the dynamics of the friendships are, in many ways. I thought a lot about how people come together – how we came together – and what makes certain people click. How friends act in a group versus one-on-one, who they trust and why and to what extent. THIS IS HOW IT ENDS is told through Riley’s eyes, but it felt like an ensemble cast to me; so much that, at one point, I considered writing the book in alternating viewpoints so each character could have a turn on center stage. I scrapped that pretty quickly and, instead, focused on understanding each character all the way around versus just in relation the protagonist. This probably sounds obvious, but it was a new exercise for me because my two prior books were SO centered on the MC. I used character development worksheets from Ingrid Sundberg’s awesome blog and elsewhere online to refine and deepen the characters during the book’s (MANY) revisions. It meant more changes to the plot when I understood the players better and knew they’d never do this or say that, but the end result felt much more authentic to me. FOR. EVER. At one point, after my agent read my third major overhaul of the book & said it still wasn’t working, I almost quit writing. Not just this book, but totally. I started working on THIS IS HOW IT ENDS in early 2011 and had a first draft about a year later. My agent – who has a phenomenal editorial eye and is right about 99.8% of the time – read it and gave me notes. I reworked it, she read, more notes. I reworked it again, sent it back. She phrased it much more politely, but to me it was still a big, black, depressing NOPE. I moped for a while, considered other bookish jobs I could do, thought hard about my agent’s feedback and eventually pulled myself out of the abyss of despair and tried again. That time, I finally got it right and in fall of 2013 we got three offers on the manuscript, accepting one from Simon Pulse. From there, it was a piece of cake…only one round of edits, mostly to change – of all things – the ending. I’ve written a total of seven books, THIS IS HOW IT ENDS was the fifth, and I’d guess my publication story – the good, bad and ugly - is pretty typical. I started my first book in 2004. It was an awful, plotless, women’s fiction mess. I don’t even read women’s fiction. And I had no idea how to write a book. Aside from Creative Writing in college, I’d never taken any classes or read any craft books or blogs or ANYTHING. I just sat down and started typing. But I finished it. And while querying and racking up 100+ rejections, I learned a ton about how to craft a novel and the business of writing. My second try became my first published novel, THE MARK. It took about two years to write and revise, 50+ rejections to get an agent, and it sold within three weeks of going on submission. Warner Brothers optioned it for TV and the writer and producer flew to NY to chat about the book over lunch (the TV show never happened, but it was still neat). My agent sold the sequel, THE VISION, the next year. But...more good stuff: my new agent is great, my fifth book sold, and the two books I’ve written since THIS IS HOW IT ENDS were so much easier. Both were fast drafts, done in six weeks or less, thanks to NaNoWriMo (which I tried for the first time with my sixth book). Each book, from the awful first one to the draft I just sent my agent, teaches me so much. I keep looking back, thinking: how did I write a book before without knowing this? 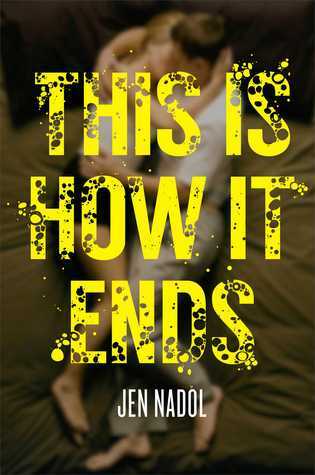 Enter here to win a hardcover copy of THIS IS HOW IT ENDS! Giveaway ends 10/12/2014 at midnight EST. If you could see the future, would you want to? After the disturbing visions Riley and his friends see turn out to be more than hallucinations, fate takes a dangerous twist in this dark and suspenseful page-turner. In the weeks that follow, the visions begin to come true...including a gruesome murder. One of Riley’s closest friends is now the prime suspect. But who is the murderer? Have Riley and his friends really seen the future through those mysterious binoculars? And what if they are powerless to change the course of events? Jen Nadol grew up in Reading, Pennsylvania and graduated from American University with a BA in literature. She's lived in Washington DC, Boston, NYC and now, an old farmhouse north of the city with her husband and three sons. When she's not writing, she's probably tending to the farmhouse or the sons, reading, cooking, skiing, or sleeping. Fantastic interview! Thanks for the chance to win! thanks for the good, the bad, and the ugly. It's always nice to hear other people's journeys! Wonderful interview, as usual. Thanks for posting it.